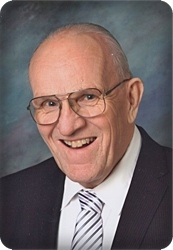 Warren A. Meyer, age 87, of Grand Rapids, went home to be with his Lord on Monday, November 12, 2018. Warren proudly served his country in the U.S. Army during the Korean War. He was preceded in death by his brother, Kenneth Meyer; and sister, Elaine Anderson. He will be lovingly remembered by his wife of 64 years, Muriel; children, Lloyd (Joan) Meyer, Laura (Richard) DeVries, Carol (Randy) DeNooyer; six grandchildren, Lisa (Zak) Thomson, Andrew (Rachel) DeVries, Valerie (Sam) Smith, Tyler (Tessa) DeNooyer, Collin DeNooyer, Mitchell DeNooyer; four great grandchildren, Lauris and Dexter Thomson, Hawkins and Poppy DeVries; sisters-in-law, Lois (Jack) Wiersum, Sharon (Ted) Bulthuis, Cathy (Ed) Pruim; many nieces and nephews. Private interment with military honors will take place at Ft. Custer National Cemetery. Visitation will be held from 2 - 4 pm on Friday, November 23, at Plymouth Heights Christian Reformed Church, 1800 Plymouth Ave. SE, where a memorial service will begin at 4 pm. Rev. Steve DeVries will officiate. Memorial contributions may be made to Holland Home Patient Assistance Fund.